In this section we can learn more about the time when William lived. Study original documents held by The National Archives and the General Register Office to see facts about William and his family. Look at a snapshot of William’s life, showing the timeline of where he lived and what he did. These are the materials the students used to create their play about William’s life. Read the letter that Oscar Wilde wrote to The Daily Chronicle in 1897. It gives the writer’s personal view about the way children were treated in prison. In the nineteenth century crime was increasing, partly due to the growth of cities. The Victorians were concerned about how to punish criminals. The usual punishment was transportation to Australia, or execution. Prisons did exist, but they were usually small, old and badly run. 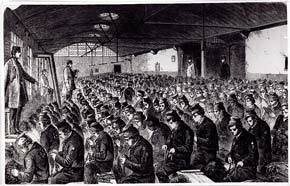 By the 1830s the Victorians decided that more prisons should be built. The Victorians believed that prisons should be uncomfortable and frightening places. They thought this would stop people from committing crime. 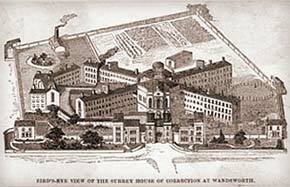 William was sentenced to one month’s ‘hard labour’ in Wandsworth prison. Prisoners had to carry out hard, boring tasks, such as walking a treadmill or picking oakum (old rope). At that time, over 1,500 children were held in the same prisons as adults. The prisoners were kept isolated in tiny cells. This was so that when they were not working, prisoners could think about the crimes they had committed. It was hoped that if they spent time on their own they might start to regret their actions. Find out what Oscar Wilde thought of the way children were treated in prison.